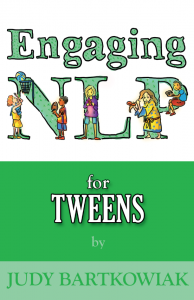 If your child is approaching ten years old he or she will find NLP for children a bit young perhaps although it is still a good basic introduction. NLP for Tweens starts with a quiz ‘who do you think you are?’ Let’s face it we all enjoy quizzes don’t we? Your child will discover whether they are visual, auditory or kinaesthetic. This will help them understand why they learn better with some teachers rather than others and prefer some subjects. It’ll help them choose the best revision techniques too. They can then go on to discover aspects of how they process their world with further quizzes and explanations of what it all means. The next chapter is about limiting beliefs, those annoying ‘I can’t’ s and how children can overcome them and replace them with resourceful beliefs. There’s quite a bit in the book about changing schools and making new friends. The next chapter is on confidence , how to get it if you’re struggling and how to keep it. There’s a chapter on goal setting and another on how to cope with the emotional ups and downs of puberty. The mind and body are one and at this age your child may not like their body. Here they are encouraged to be healthy and fit and to look after it. If you answered mostly ‘A’ then you are more visual. You think in pictures and images. You will remember what you’ve seen and will be observant. You notice body language and facial expressions and can know a lot about people before they’ve even spoken. Visual people tend to speak quite quickly. Do your friends tell you to ‘slow down!’? Your descriptions will be colourful and bright and your surroundings will be important to you as will your appearance. You will (if you’re allowed) have pictures and photos all over the wall of your bedroom and you will have wanted to help choose the colour scheme. Your clothes will be important to you and you enjoy shopping for new clothes that capture the look you’re after. You’ll enjoy flicking through magazines for ideas about fashion and notice what the celebs are wearing. You’ll probably watch programmes on TV about fashion and makeover. You’ll spend ages getting ready to go out as you need to look perfect. You’ll certainly notice what your friends are wearing and be embarrassed if they look bad because you won’t want to be seen with them. Boys, you too can be visual and you care how you look. Your emphasis may be on your body and muscles, building up that ‘six pack’ and impressing the girls with your physique and hair. You want to look your best and follow fashion, wearing the top brands. You can’t wait to drive and what your first car looks like will be more important than what is under the bonnet. Colour, lines and style will be considered and discussed with friends for hours. If you are visual then you will learn best from seeing rather than hearing, so make notes in class because you’ll remember what you see in your notes much better than trying to remember what was said. You will find mind maps, flash cards and visual representations of facts helpful when you’re revising because it will stay in your head better like that. Tony Buzan has written lots of excellent books and has produced software that you can use to make your own mind maps. Use YouTube videos and BBC I player, DVDs and whatever else you can find that appeals to your visual senses. The last chapter is about relationships, peer group pressure and bullying. This book is only available in English and Italian at this time.